Alexandra's parents had purchased this wheel in 1987. They have bequeathed it to her. 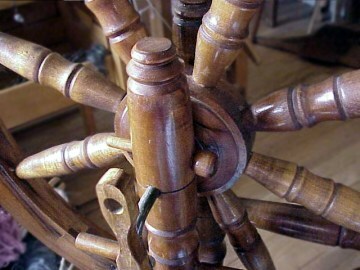 It's a special wheel in that it was hand crafted locally by the late J. R. Kennedy out of an indigenous wood species called Oregon Myrtle/California Bay Laural (Scientific Name: Umbellularia Californica - Family: Lauraceae.) It is a distinctive wood specific to a small area of the western coast of the United States. 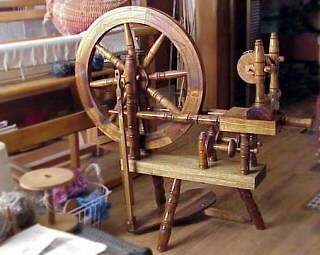 The wheel itself is of a hefty European design and incorporates a unique blend of old world and new world technology. Each facet of the wheel is hand crafted. This is the flyer assembly. The metal components are one of a kind and specially made made for this wheel. Over the centuries spinning wheels have taken on a very romantic set of terms to describe their various parts. The flyer assembly consists of "the mother of all", the foundation upon which the flyer assembly rests. The "flyer" itself is the horseshoe shaped piece. It is supported by the "maidens," two upright pieces on each end of the assembly. They contain the "leather bearings" which hold the metal "orifice" that runs through the flyer. 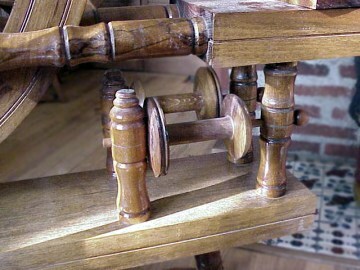 The "spindle whorl" and "bobbin whorl" are held in place by the "orifice" also. 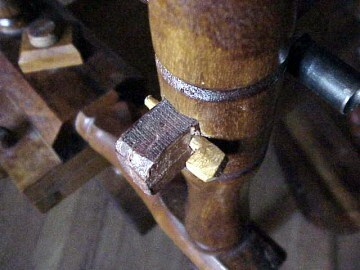 Hand carved wooden peg that holds the the leather bearing in place. 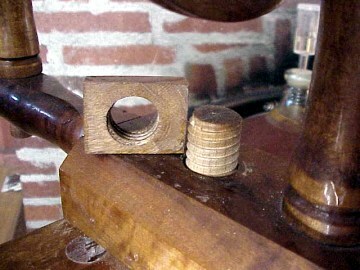 Here we have a wooden screw with a wooden nut that hold the flyer assembly to the "bench stock" or main base of the wheel. It is used to keep the "mother of all" (the flyer assembly base) in position once the tension of the "drive band" (wheel string) is correct. Isn't that an amazing piece? Here the flyer assembly has been removed to reveal the wooden tension screw assembly used to tighten the drive band so it doesn't slip on the wheel. It is a truly fascinating technical and artistic achievement in wood. 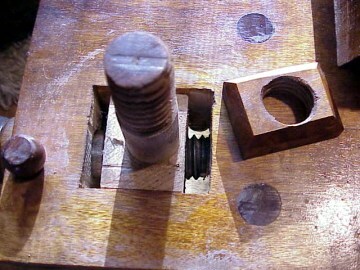 Another view of the tension screw assembly. 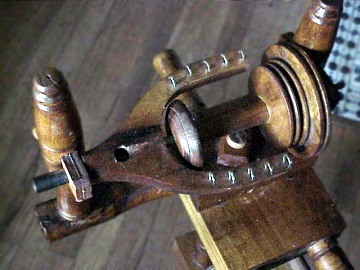 The "bobbin rack" holds extra bobbins. These will be full of the mohair yarn when their time comes. 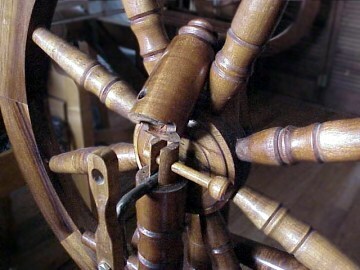 The long stationary rods that support the wheel are called "bearers". 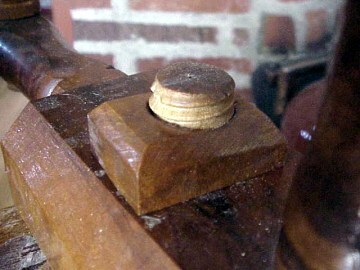 This pair is very unique in that they are capped in such a way as to allow for the easy removal of the main wheel. By pulling the peg from the bearer the hollowed out top cap of the bearer is removed exposing the "axle and crank" of the spinning wheel. 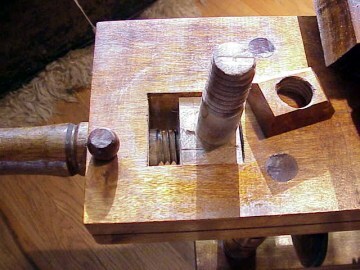 It is a very complex configuration rarely seen in wood mechanisms. By far this does not cover the entire subject at hand. The information here was presented only to illustrate the particularities of our new wheel that I haven't seen elsewhere. We are grateful to have inherited such a wonderful, yes, even mysterious tool. It carries with it the mystique and momentum of skillful fiber artists of ages long gone. The legacy of a skill developed to supply such a fundamental needs as warmth and shelter from garments has not been lost in our super-mechanized culture. Fiber artists abound. The substance of Mr. Kennedy's work will not be relegated to a museum.